Applications are invited from eligible candidates having UGC norms with NET/SLET/SET (as mandatory requirement) Ph.D. (compliance with UGC regulation 2009) M.Phil degree obtained on or before 10.07.2009 (excluding candidates obtained M.Phil/Ph.D. 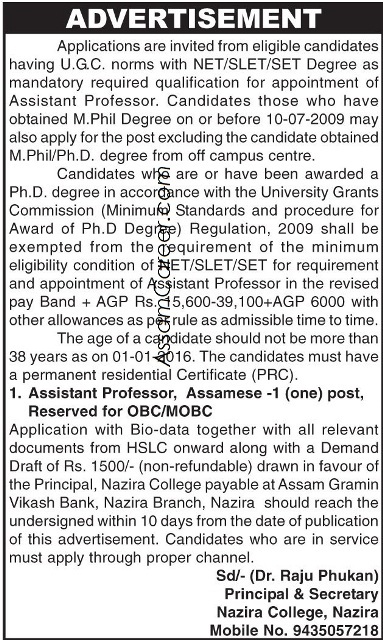 degree from off Campus Centre) for the following sanctioned posts of Assistant Professors in the UGC scale of pay in Nazira College, Nazira, Sivasagar. The age of a candidate should not be more than 38 years as on 01.01.2016 and relaxable upto 5 years for SC/ST candidates. The candidate must have a PRC. Application with bio-data and all relevant documents from HSLC onwards along with a Demand Draft of Rs. 1500/- (non- refundable) drawn in favour of the Principal, Nazira College, Nazira, payable at Assam Gramin Vikash Bank, Nazira Branch should reach the undersigned within 10 Days.